Jaesun Han (M.M.) is currently the concertmaster of the Brockport Symphony Orchestra. In 2016, Jonathan Allentoff invited her to join the Brockport Symphony Orchestra (BSO). With the BSO, Ms. Han has appeared as a soloist multiple times. Her violin solos rose up out the midst of the orchestra’s playing, and blended back in again seamlessly. She earned her Master’s degree at Hanyang University, one of the distinguished music schools in South Korea. She is originally from South Korea, and moved to the United States in 2013. She began studying piano from the age of 5, and began studying violin from the age of 7. After that, at age 10, she became a prizewinner of the Teen National Music competition. She also entered the Sunhwa Arts School at age 12. There she developed her dream as a violinist and laid the foundation for music. She participated and won several nationwide competitions that were sponsored by universities. At the same time, Ms. Han also participated in many music festivals, and performed chamber music and orchestra music that gave her a variety of musical experience. She also studied authentic classical music with Kyungmin Kim (Diplom of Hochschule für Musik und Tanz köln and Hannover, International Menuhim Academy, Solist Diplom with I. Ozim), and Jaemin Lee (Hochschule für Musik Freiburg) at Chugye University for the Arts. At the college, she had the honor of playing at the “Outstanding Player’s Concert” and “Representative performer for conference”. At those concerts, she played Bach's Partita No. 2 for solo violin. Also, Ms. Han was awarded the Superior Academic Performance Scholarship. She also studied with Soonik Lee (graduated from Curtis Institute of Music, Prize Winner of the Nicolo Paganini International Violin Competition), and Sanghee Kwon (graduated from Peabody Institute) at Hanyang University. Also, she studied orchestral music with Chakyung Eom (diplom of Universitaet fuer Musik und darstellende Kunst Wien, diplom with Rainer Kuechl). At graduate school, she performed as a leader of String Quartet, Piano Quintet and many other Chamber music ensembles. She had a solo recital centered on Sonata in Romantic times and also wrote a thesis; A Study of Vivaldi’s Early Solo Concerto Forced on "L’Estro Armonico" Op. 3 (1711). She was appointed Associate Principal Violin Player of the Guri Philhamonic Orchestra in the spring of 2010 and she also played as a guest Principal violinist several times. In the Guri Philhamonic Orchestra, she performed the Vivaldi Concerto for 4 violins in B minor as a soloist. Jaesun Han also performed in many orchestras, including the Seoul Philharmonic Orchestra, Gangnam Symphony Orchestra, Seoul Symphony Orchestra, Metro Philharmonic Orchestra, Eirene Philharmonic Orchestra, MJD International Orchestra, Soli-all Orchestra, Gwacheon Symphony Orchestra, Hyosung Chamber Orchestra, and the New Seoul Philharmonic Orchestra, among others. Ms. Han has appeared as a soloist and chamber musician, not only in Korea and the United States, but also in Russia, Israel, Thailand, Japan, and Taiwan. Beginning in summer of 2000, she also made numerous mission trips to Japan and Thailand, where she taught and performed at Saitama Super Arena, Amori Prison, and many universities. 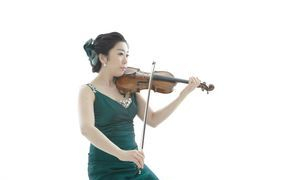 In Korea, she performed as both featured soloist and with chamber music groups doing background music for television ads, performing the New EF Sonata for Hyundai/Kia Motors, broadcasting appearances for “The Rite of Spring” shown on ARTE TV, “Daejin Kim’s Music Class” for the Korea Educational Broadcasting System (EBS), The Concert for Pastors, Christan Global Network Television (CGN), Seoul South Korea. Jaesun appeared as a violin performance model for Arirang TV for the Seoul Art Center and performed a recording of "Another Life", and "GMC Easter Cantata Album." Ms. Han is an enthusiastic violin teacher, and has Music Teacher Certification and after School Music Certification from Seoul, Korea. She also taught at many elementary and high schools. In addition, she worked as an instructor at the headquarters of the YAMAHA Music School of Korea. As a teacher, Ms. Han’s students have received awards and prizes. Also, she played as a music director at Onnuri Church (one of the largest Korean churches). In 2014, she worked for a year in Gainesville, Florida, as a private violin instructor for several students as well as being the violin instructor for the Korean Language School. While at Gainesville, she was a conductor for the Youth Orchestra at the Korean Baptist Church of Gainesville. She also performed as a guest choir conductor at the Korean Baptist Church of Gainesville, played at All Nations Church of Rochester, and conducted a Youth Orchestra at the Rochester Korean United Methodist Church of Rochester. Jaesun has lived for the past two years in Brockport, New York with her husband Mark (who is an assistant professor at College at Brockport, SUNY), and her 5-year old daughter Eunki. She is looking forward to welcoming new violin students and music friends in this area.